Shizuka New York Day Spa’s newsletter brings you the latest skin care tips and spa specials. To receive our free email newsletter, please sign up here. Volume 176: Holiday Spa Deals! Thank you for visiting SHIZUKA new york this year! We hope you will enjoy our services until very end of 2017 (and next year too, of course). In appreciation, we’ve selected party ready treatments and gifts for Holiday spa deals! Volume 175: Fall Spa Beauty Weeks! We’re excited to announce that Shizuka NY’s Fall Spa Beauty Weeks is here! Receive huge discounts on popular spa treatments! We hope everyone had a wonderful summer! Give your skin a complete overhaul with these after summer spa deals for deep cleansing facials and body treatment! Volume 173: Father’s day gift from SHIZUKA new york! Treat Dad to some much-needed relaxation this Father’s Day with a bit of grooming and polishing at Shizuka NY Day Spa. We’ve selected perfect treatments to celebrate the occasion! Volume 172: Mother’s day gift from SHIZUKA new york! Mom deserves gratitude and love every day, but we are making it easy to spoil her this Mother’s Day with our special Mother’s Day spa deals. This Mother’s Day, gift Mom (& Moms-to-be!) the gift of pampering and relaxation from SHIZUKA new york Day Spa ! We’re excited to announce that SHIZUKA new york Day Spa will be featured on a Lifestyle TV show “Cosmo Times” this Saturday April 8th, 2017! Shizuka performs the Geisha Facial® at 7pm EST on SinoVision English Channel on Time Warner digital cable channel 24.3 . Our latest Acne Facial uses FDA-cleared Blue Light technology. We deeply appreciate your continued support throughout 2016 and we wish you the very best in 2017! We’re looking forward to serving you in greater ways than last year. As 2016 comes to a close, we want to thank you, our loyal customer, for your patronage and support throughout the year. We’re constantly working to bring you the best in spa care and treatments—thank you for letting us serve you! We wish you a safe and happy holiday season. With appreciation for your continued support, we’ve selected our most popular party-ready treatments! All can be taken on the same day of a party or event! Volume 167: Fall Spa Beauty Weeks at SHIZUKA new york! Fall is here! We are offering special deals for Fall Spa Beauty Weeks at SHIZUKA new york! The hot summer heat wave is now gone. It’s a perfect time to cleanse pores clogged by sunscreen use and sweat from the beach and outdoor activities! We are offering special deals to have a clean look for the coming season! We’re excited to announce SHIZUKA new york Day Spa will be featured on Japanese TV program Sekai no Nihonjin zuma wa mita (Japanese wife in the world) next Tuesday August 23rd, 2016! Shizuka performs The Geisha Facial® for Actress Yoka Wao on MBS Sekai no Nihonjin zuma wa mita at 7pm JST! Volume 164: Summer Spa Deals for Glowing Skin All Summer Long! It was nice to celebrate your mother and father with our Mother’s day & Father’s day spa deals! We have a special Summer Spa deals just for you to have a Glowing Skin All Summer Long! Get ready for the hot weather and enjoy the summer with our selected services! Volume 163: Father’s Day Spa Deals and Gift ideas from Shizuka NY! Father’s Day is June 19th ! We’re offering several Men’s Spa Deals for Dad to look and feel his very best! Father’s Day Spa Deals are sure to soothe his senses and renew his spirit. Volume 162: Mother’s Day Gift from Shizuka NY! SHIZUKA new york wishes you a truly peaceful Mother’s Day this May 8th! Spa experience is always a good choice to escape from a busy life. Give your Mom a relaxing time for this Mother’s Day at Shizuka New York as an appreciation! Volume 161: ShizukaNY April Spa Steals Week is here! We’re happy to announce this year’s April Spa Steals Week! April Spa Steals includes the facial loved by celebrities and Shizuka New York fans! Volume 160: Recent and Upcoming Press! We’re excited to announce SHIZUKA new york Day Spa will be featured on Japanese TV program King’s Brunch this Saturday March 26th, 2016! Shizuka performs The Geisha Facial® for TBS King’s Brunch at 1pm JST! It’s getting warmer day by day. We can’t wait until the spring comes! Have a smoother skin with our IPL Hair Removal and revitalize your skin with our Anti-Aging Photofacial using our New Spa Deals for Spring to complete your spring look! Volume 158: Valentine’s Spa Deals for 2! Valentine’s Day is coming up and we’re thrilled to offer these SNY Signature Spa Deals for 2! Enjoy a relaxing treatment with your sweetheart and celebrate your love with a champagne and Godiva chocolate toast on us! Thank you for your patronage and support this year! We hope you will enjoy our services until very end of 2015 (and next year too, of course). Cheers to the participants of the 2015 New York City Marathon! Soothe tired and overworked muscles and bring relief to minor injuries and joint pain with a healing massage from Shizuka New York! Happy Halloween! Just because it’s almost Halloween doesn’t mean you need to look ghoulish this fall. Instead be boo-tiful with these new spa deals for flawless fall beauty! As we bid farewell to the hot summer days and transition into cooler weather, a change in skincare regimens is in order. It is also the perfect time to cleanse clogged pores from summertime buildup of sunscreen use and sweat. As summer gets underway, we hope you’re stocking up on summer essentials like water, sunscreen, and even some refresher mist to keep you cool and refreshed throughout the season! Volume 151: Happy Mother’s Day from SNY! This year give your mom the gift of relaxation and pampering with a SNY Mother’s Day Gift Certificate for any of our signature spa treatments such as The Geisha Facial or Signature Micro Facial. Spring is in the air! Refresh your youth glow for spring with these Spring Spa Deals! We’re excited to announce SHIZUKA new york Day Spa will be featured on E! News’ A-List Beauty Secrets special next Friday February 20th, 2015! Volume 148: Valentine’s Spa Deals for 2! 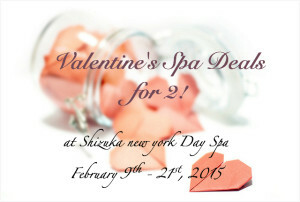 Indulge your sweetheart this Valentine’s Day with relaxation and pampering at Shizuka NY! Volume 147: New Year’s Spa Deals – Happy 2015! This New Year’s we’d like to celebrate YOU, our valued customer. Thank you for your continued support throughout 2014 and we wish you the very best in 2015! Now that it’s October, in addition to pumpkin spiced lattes, it’s the perfect time for warm aromas and IPL Treatments! Autumn Spa Deals are valid October 16th – November 16th, 2014! As we prepare for the cooler months ahead, it’s the perfect time to rejuvenate your skin from all the summertime build up! Vol. 143: August Spa Deals – Get Ready for Labor Day! July Spa Deals are extended for another month! These Spa Deals will last from now until September 7th, 2014, so get ready for Labor Day Festivities with style! Vol. 142: July Spa Deals for Glowing Skin all Summer Long! We are pleased to offer these spa deals to help you beat the heat and keep your skin glowing all summer long! July spa deals are available July 11th – 31st, 2014. Throughout the month of June, enter to win a $300 Gift Certificate to NYY Steak Manhattan! NYY Steak’s newest location is in our building. We’re thrilled to announce our newest addition to Shizuka new york Day Spa’s hi-tech treatment technology: the Lumenis M22™! This Mother’s Day, gift Mom (& Moms-to-be!) the gift of pampering and relaxation from Shizuka NY Day Spa. May 1st – May 18th, 2014! Throughout the month of April save up to 20% on Spa Deals for NYC Eyelash Extensions, Gel Nails, Waxing, & Coffee Break Mud Wrap, April 2nd – 30th, 2014! Hi Shizuka NY Insiders,After this particularly long winter, spring can’t come fast enough to NYC! Bid farewell to winter with these Spring Forward Spa Deals valid March 1st – 30th, 2014. Indulge your inner romantic with these NYC spa deals for 2! Our Valentine’s Spa Deals are valid from February 9th – 17th, 2014. Happy New Year to Shizuka NY Insiders. We now have a beautiful new lobby and a new restaurant in the building — the New York Yankee Steak House is now open for business! As a token of our appreciation this holiday season we are offering Holiday Spa Deals on our most popular party-ready treatments! November 25, 2013 thru December 31, 2013. All the best to the participants of the New York City Marathon! We’re offering 20% off ALL Massages to all participants and fans from Nov. 3rd – 9th, 2013. We’re excited to announce Shizuka NY’s Fall Spa Steals Week will be October 14th – 24th, 2013. As the summer trails to an end, we invite you to relax and SAVE with these month-long Labor Day-inspired Spa Deals! Volume 130: August Weekend Spa Deals & More! Big Weekend Spa Savings: FRI-SUN! PLUS save 15% on any treatment series! Hot Summer Deals to cool down to including: massage + facial, nails, waxing, and more! Volume 128:Happy Father’s Day Spa Specials 2013! Exciting Spa Deals for every kind of Dad! “Just for Mom” & Mother and Daughter Spa Specials May 3rd – 19th, 2013! Volume 126:Spa Steals are here! April 15-24th, 2013: Save on The Geisha Facial®, Swedish Massage, and Eyelash Perm! Take 15% off of Naturopathica’s The Natural Face Lift Facial during the month of April! Refresh and renew with these spring spa deals during the month of March! Pampering for you and your special someone all week long! Start the New Year with our discounted Anti-Aging Photofacial and other luxury treatments! Volume 121: Holiday Gift Certificates Available Now! 2 ways to purchase Holiday Gift Certificates for those special people on your list! Happy Holidays! Enjoy discounted gift sets and spa deals galore! For the month of November, we are offering 50% off all IPL Hair Removal Services. Vol. 118: October 2012 Hurricane Sandy! Vol. 117: Shizuka NY *Extended* Spa Steals Week! Our Fall Spa Steals Week is back! Enjoy huge savings on The Geisha Facial, Gel Manicure and massages! Celebrate the end of summer with these unbeatable deals for facials, eyelash perms, and more! Beat the heat with 15% off all Nail Spa treatments all summer long! Recent press we’ve been receiving about our Geisha “bird poop” Facial. We’ve updated a couple of our services and appointment booking features! Throughout the month of June, treat Dad to some much-needed relaxation this Father’s Day! Mother’s Day Spa Gifts, Mother and Daughter Spa Days, “Just for Mom” Pamper Break and more! Save BIG on our popular Geisha “bird poop” Facial, IPL Hair Removal and Gel Nails! Make sure to book early! Spring for our March Madness spa savings for IPL Hair Removal, Gel Nails, Facials, and more! Romance your skin with our facials, pedicure and body treatments highlighted by roses and chocolates! Celebrate Valentine’s Day with us Feb 10-14th, 2012 with these Spa Specials for TWO! Vol. 106: Happy New Year! With appreciation for your continued support, we are offering these New Year’s spa specials. Happy 2012! Vol. 105: Party-ready Holiday Spa Specials! Receive 20% off of spa treatments for that perfect holiday party ready look, plus get a FREE Collagen Mask upgrade with the purchase of a Classic Facial! Check out our featured spa treatments just in time for the holidays: Collagen Mask, Lunchtime Peel, and more! Vol. 103: Welcome 2011 NYC Marathon! Welcomes all NYC Marathon participants and fans to SAVE OVER 20% on our spa massages! Halloween Spa Specials to make you scream include our famous Geisha Facial®, Gel Manicure, and more. Take advantage of these after summer spa deals, through Oct 31, 2011. The 100th Edition of our spa newsletter features a summer spa deals, skin care tips, and the best of our first 99 newsletters. Half-Priced Geisha Facial® and discounted massages are offered during Shizuka New York Day Spa’s Spa Steals Week, April 11-17, 2011. Shizuka New York Day Spa donates 100% of the proceeds from soy candle sales to victims of the Northeastern Japan earthquake and tsunami through April 17, 2011. Save over 20% on Swedish Massage and Shiatsu Massage every Friday, all day long! Get into Spring with these awesome spa deals on some of our most popular spa treatments and packages. Save 10% on all non-medical spa treatments the next time you check into Shizuka NY Day Spa on Facebook using your mobile device. Valentine’s Day Spa Specials for Couples include select facials, massage and nail salon treatments. Save up to 15% February 7-20,2011. Shizuka New York Day Spa rings in the New Year with “11 Spa Deals for 2011,” available January 3-31. Find great deals on Holiday Nail Art for our Gel Manicure, and moisturizing Paraffin Hand Treatments good December 12 – 31, 2010. Save over 20% on Japanese-style shiatsu massage with shiatsu specialist, Yukitoshi on select days between 11am – 2pm. Holiday shopping is simple when you give a Shizuka New York Day Spa gift certificate; Holiday Spa Packages take care of you before and after your big events, good from “Black Friday,” November 26, 2010 – January 7 2011. Save $42 off the list price when you combine our popular LED Gel Manicure and Eyelash Perm. Also, get a free BlackBerry Hand Massage with every Men’s Manicure and 10 minutes of complimentary Reflexology foot massage with Men’s Pedicures November 1 – 14, 2010. Get yourself ready for Halloween with spa deals on our exclusive Geisha Facial® and nail salon treatments October 18-31, 2010. Vote for Shizuka NY in the Best of Citysearch, and save 15% on the treatment of your choice when you review Shizuka NY on Yelp or Citysearch through November 15. Get ready for our best deals of the year October 4 – 14, 2010. During Spa Steals you can save big on facials, massage, manicure/pedicure, and IPL hair removal. Take an hour off from your daily grind to rejuvenate your body and mind with an hour of spa for $55, September 20 – October 3, 2010. After the hottest NYC summer on record, beat the heat with a great discount on our popular T-Zone Facial through September 19, 2010. Save this discount for an additional 3 months by purchasing a treatment online. Shizuka NY welcomes Dr. Kamran Jafri, a gifted facial plastic surgeon who will join Dr. Robert Silich in performing Botox and Juvederm injections in our NYC Medical Spa. Our new LED Gel Manicure is 20% off through Labor Day, September 6, 2010! Father’s Day is June 20, 2010. Find spa deals for dad on a great massage and facial as well as Father’s Day gift certificates in this edition of our spa newsletter. Save up to 50% on our NYC waxing and IPL laser hair removal treatments all summer long! Spa deals and gift certificates to celebrate Mother’s Day, May 9, 2010. Try the new Eyelash Extension Starter treatment ($150, 90 min) from our New York Day Spa. Shizuka NY insiders get great savings on facials, massage, manicures and pedicures during Spa Steals, April 12-18, 2010. Shizuka New York Day Spa introduces new body & wellness treatments including acupuncture and thai massage. Take advantage of our New York day spa’s great Laser Hair Removal Deals during March 2010. Receive a complimentary chocolate and champagne toast with every couples massage, or try a Single (And Loving It!) spa package. VOL 45, MAR 2008 New Spa Treatments are highlighted. SPECIAL EDITION SHIZUKA new york Spa welcomes Dr. Robert Silich, now offering Botox, Dermal Fillers, and other medical cosmetic treatments. VOL. 39, APR/MAY 2007 Spa Packages and gift sets to make Mom’s day even more special.